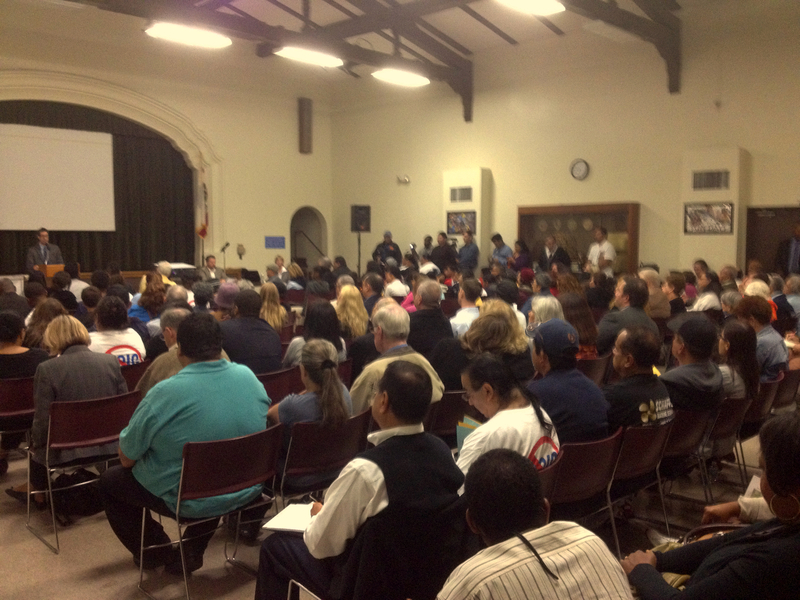 The Silverado Park Community Center was packed wall-to-wall for 7th District Councilmember James Johnson’s Do-It-Yourself public hearing regarding the proposed Southern California International Gateway (SCIG) railyard project. The hearing followed a denial from the Port of Los Angeles to include a meeting in Long Beach for Long Beachers. The first and only formal public hearing was held in Wilmington much to the chagrin of West Long Beach residents, the largest group to be affected by the 150 acre project. There was little to distinguish those representing BNSF and the Port of Los Angeles and those from the community given the high attendance, with standing room only for most of the meeting. Port staff–along with translators and a court reporter to record–were on hand to present the project itself as well as explain the differences between the first Draft Environmental Impact Report and the current recirculated version of the document. The night was not without its political theater: signs were abound and a comic book created by children about air pollution was passed around. There were tense moments where voices were raised, speakers wept, and crowds cheered and howled. After the Port of Los Angeles Environmental Management Director and his staff presented the SCIG proposal, the Councilmember opened the comment period with his own with concerns about pollution, the lack of zero emissions technology for trucks, and the potential for mitigation, including the removal of the Terminal Island Freeway north of Pacific Coast Highway. He stated that what was currently being offered was simple: nothing. The balance of comments from the community ranged across the spectrum: there were those against the project for the potential environmental impacts while there were many in the audience who spoke on behalf of it for economic development. There appeared to be a dynamic of union workers for the local building trades–who signed a labor agreement with BNSF earlier in the year for construction of the rail yard–reading scripted cards and residents speaking passionately of the current health conditions from the poor air quality with concerns that the project would exacerbate. Detractors included Susan Nakamura from the Southern California Air Quality District, who spoke to oversights in the current draft of the EIR as did representatives from the Natural Resource Defense Council. Long Beach School Board Member Felton Williams and District Facility Director Carri Matsumoto both spoke of concerns that the facility would have on the student population for the students at Cabrillo High School and Hudson Elementary School. Weston LeBar, representing the Long Beach Area Chamber of Commerce, spoke in support of the SCIG project on behalf of their membership. In the end, there were differences of opinion on whether the SCIG would improve the local environmental conditions or not, based on the ill-grounded claim that 1.5 million trucks would be removed from the I-710 Freeway as they carry freight from the Ports of Long Beach and Los Angeles to the BNSF Hobart Yard in the City of Commerce (a 5 mile trip leaving from the SCIG versus around a 20 mile trip leaving from the port). This led to the ultimate question of whether the proposed SCIG replaces Hobart Yard or whether there will be two yards. An activist in the Commerce area who spoke stated that there were actually plans to expand the Hobart facility, where SCIG will act as a gateway for international containers while Hobart will remain open and ship out domestic containers. The reason which some believe the Hobart yard is being expanded is due to the increasingly popular goods movement trend of transloading, whereby three 40-foot international containers can fit into two 53-foot domestic containers; these containers are then labeled as domestic despite having international goods inside and are then transfered to domestic shipyards, such as Hobart. Many speakers expressed their frustration with what they felt was an exclusion from the public process with many thanking Councilmember Johnson for his efforts to provide a forum for the community to express their voice. After two and half hours, the auditorium has largely cleared out when the last person spoke. Electrify the railyard. Why not? Good for Johnson now he needs to say that the railyard should not be built.